A break in the mad-dash-to-finish-Midnight-and-Moonshine radio silence to share some awesome news I’ve been sitting on for a couple of weeks, and can now finally reveal. 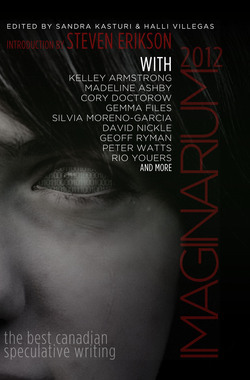 I am totally over the moon that ‘Fur and Feathers’ (from Bluegrass Symphony) has been included in the incredible Imaginarium 2012: The Best Canadian Speculative Writing, edited by Sandra Kasturi and Halli Villegas (ChiZine Publications and Tightrope Books). The book has SUCH an amazing line-up, with authors like Cory Doctorow, Gemma Files (whose work I LOVE), Geoff Ryman, Amal El-Mohtar, Kelley Armstrong, Peter Watts… and so many others! And then there’s me. Wow. Also exciting, two other stories from Bluegrass — ‘The Short Go: A Future in Eight Seconds’ and ‘To Snuff a Flame’ — made the Honourable Mentions list! Thanks so much, Sandra and Halli! You can see the Honourable Mentions list here. Tags: a.c. wise, ada hoffman, amal el-mohtar, anna mioduschowska, bluegrass symphony, camille alexa, carolyn clink, chizine publications, claire humphrey, cory doctorow, CZP, david livingstone clink, david nickle, derek künsken, gemma files, geoff ryman, geoffrey w cole, george swede, halli villegas, helen marshall, ian rogers, imaginarium 2012, kathryn kuitenbrouwer, kelley armstrong, kelly rose pflug-black, kristin janz, madeline ashby, neile graham, peter chiykowski, peter watts, rebecca m senese, rhonda parrish, rio youers, robert runte, sandra kasturi, silvia moreno-garcia, steven erikson, susan ioannu, tightrope books, timothy reynolds. Bookmark the permalink.